To even start the discussion, we need to go over how our decision making even works. We’ll be covering some of the same research from the Brands as a Frame post, but we can go over the highlights as a refresher. This is important because System 1, the subconscious, automatic decision making system, is the one that largely affects our day to day experience of life and the one that is largely affected by our environment and the current contextual situations that we find ourselves. Another study showed that even our expectations of an experience are a System 1 function, meaning that what we expect to experience from a situation is largely automatic and built from past experiences. Ok, so taste and smell can be linked to subconscious changes in behaviors and automatic expectations, but can the same be applied to sound? Sound and how we experience it has been studied for a long time, but more recently there’s been research to see how music actually affects our decision making. This is notable because before this, Behavioral Psychology recognized that the context of which we make decisions (e.g. our immediate environment, our personal background, the events that lead us to the moment of making the decision, etc…) affect the kinds of decisions that we make, but music and sound weren’t studied to the same effect. It was more generally researched in the context of consumer behavior, e.g. How context such as packaging, store layout, personnel behavior, and even music affects how we shop and how interact in a business establishment, and became a subfield known as Atmospherics . Here’s the big “So What” of the matter. So what that music is experienced in the background, largely automatically. So what that music and other background effects to our senses can affect our behavior so drastically? More generally, the context amplifies our emotions which feeds back into enhancing how we experience our context, all of which affects how we make decisions. This isn’t just a phenomenon for fast-paced exciting music as well. Dissonant music mixed with the survival/horror element builds off of one another to promote the feeling of uneasiness and reckless hurried behavior. But more importantly what the research shows is that even just changing the music in a situation causes decision making to change, i.e. exciting music causing excited, erratic behavior. This is important because that means music is a key component in cueing a player not just in how to react to a scene, but to know how to act within a scene. The fast exciting music cueing that a player needs to prepare for a fight, but also using a slow contemplative piece to cue for a player to explore the area and take their time. This may go in contrast with the context of scenes that occurred recently within the game, like just finishing a shootout and a reaction that there might be more coming prompting a quick escape vs the player knowing subconsciously that it’s ok to meander about for a bit because the danger has let up. This shows why music choice is important for particular areas of your game. Take Legend of Zelda games trying to keep motifs of Adventure in the overworld and slower paced Exploration music in its dungeons and caverns or the faster more hectic Combat music of the bosses, irrespective of the emotion that they are trying to convey like the carefree nature of the towns in light world vs the contrasting despair in the dark world and so on. This also leads to a discussion of the interesting choices that some games make in how they use music within their game. Take Uncharted 4, for instance. 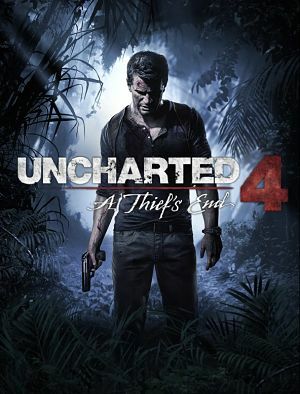 Of the Uncharted games, Uncharted 4 probably uses music the least within the game. The game even opens up to a title screen with a dim soundscape. No fanfare, no recognition to the main theme of the Uncharted series. Compared to Uncharted 2 which tries pulling you back in as quickly as possible. The only real time the game leverages music are during the shootouts to signify when you’re in a shootout and when a shootout is over with, and a few character interactions scenes, notably the one with Elena at the end of Chapter 17 as you drive towards the final stages of the game. 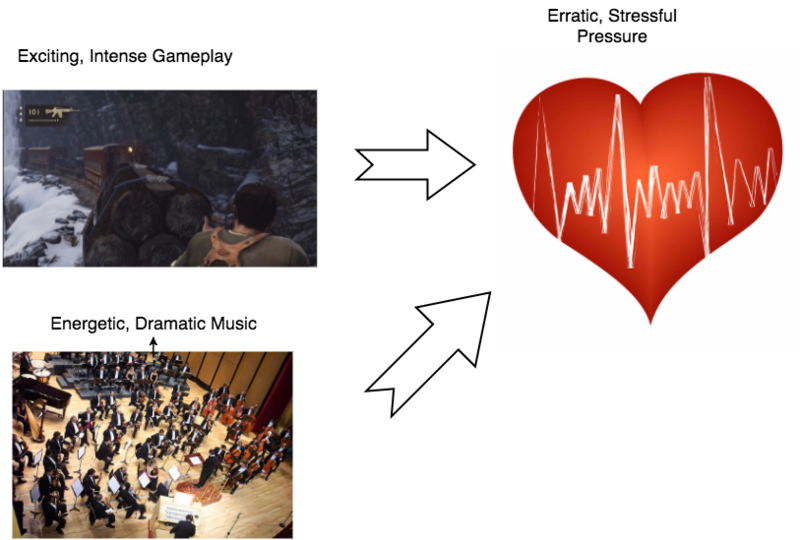 Outside of these notable moments, music isn’t leveraged much within Uncharted 4. What that also means is that a player’s choice in how they want to interact within the scene is largely up to themselves since the music isn’t acting as a cue to how they should interact. It’s your choice if you want to explore an area or leave it quickly because you want to find out what happens next or you think that more baddies are on the way and you’re trying to get out before that happens. It’s a strange choice to make because it’s largely a player directed choice against the Uncharated’s cinematic style for a potentially exploration based one. The series has always tried to ride the line between cinematic vs exploration based gameplay and it leads to a potentially larger disconnect depending on who is playing the game. This also leads to exploring Antithetical Music, or music that goes against what a scene is trying to convey. Take a game like Call of Duty: Modern Warfare. The first scene has you infiltrating a tanker ship only to cause it to sink forcing a dramatic escape. While the cinematics lend itself to the gravity of the situation, the music has some issues. While the music and the scene try to go for dramatic intensity, there is a difference between 80s and 90s action drama versus contemporary action-drama background. Dissect the scene all you’d like around loneliness and unparalleled odds, but the sense of danger brought just through the music is much more pronounced than just “cinematic-excitement” that the Modern Warfare clip showed. In short, how we act and the decisions that we make are affected by many things. Too many things. Music is only one of the many things that affect our choices, but it’s experienced primarily subconsciously which can lead us to do things we might not normally do and change how we experience a situation. So if you want a player to do something in particular or feel something specific, maybe the right kind of music will cause them to act that way. At least try to get the music to match the scene, because when it doesn’t it not only makes the scene suffer but changes the tone and our behavior in the moment to something that you probably didn’t expect. Kahneman, D (2003). “A perspective on judgement and choice”. American Psychologist. 58: 697–720. Great post as always! And as someone who regularly visits a prominent second hand establishment in the UK called CEX which has a habit of playing heavy metal music at a loud volume, I’m glad that someone researched the effect of music on shoppers. There have been times when I have walked in the shop, heard the music going loud, noticed there’s a queue, and walked straight back out because I don’t want to be stuck standing there subjecting to my ears to the nonsense coming out of the speakers (nothing personal, heavy metal). As for the application in games, I can remember many times when an action sequence has finished, and yet rousing music continues to play, and I’ve found myself wanting to rush on even though there’s no pressing need. That’s not exactly subconscious obviously since I’m aware of it, but there’s no doubt that music plays a major part in the way we interact with games.